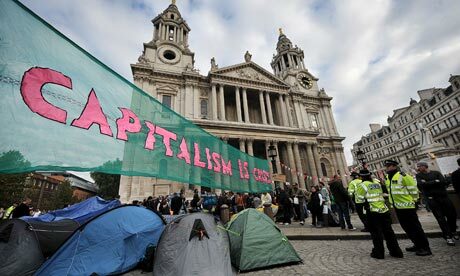 There’s a good chance that God has been receiving a few irreverent prayers of thanks from journalists this week as the Occupy London Stock Exchange protest camp and St Paul’s Cathedral have continued their uneasy coexistence. Media spotlights tend to illuminate briefly things that are falling apart*, so when the Church is in the news it’s unlikely to be for reasons that will bring cheer to any of us who are part of it. With so many different voices coming from within the Church, the caricature being created is that of an old man trying to ‘boogie’ with a bright young thing, to the general embarrassment of all but himself, before his sour-faced wife storms across the dance floor and tries to break it up, replacing one awkward scene with another. At its bare bones, it seems to me hardly fair that a protest against one institution prevents another going about its work. As has been noted, it doesn’t bear thinking what the press response would be if it was their work being hampered by campers. From the Church’s perspective, it does have a call to honour authority, which includes questioning and subverting it – no wonder it struggles to give a coherent opinion. The episode has provoked a lot of ‘What would Jesus do?’ chat, which is no bad thing if you can hear the truth among the noise. The most prevalent attitude seems to be an ahistorical romanticism of Jesus as everyone’s hero: He’s great but Christians, from St Paul himself onwards, have hijacked His message for their own nefarious ends - such as, presumably, Paul’s famous definition of love. To make your mind up, you need to read the accounts of Jesus for yourself: the magnificence of His character and the cataclysmic nature of His message will not be reduced to a sound bite or two. You can do this online and on electronic reading devices for free; if you come along to my church we’ll give you a paper copy of the New Testament with our compliments. It just so happens that I’ve preached about Jesus a couple of times recently: on His certainty of Himself, and the call He makes to all of us to follow Him. There’s enough there to unsettle bankers, priests and protesters. *The Church can often be found putting things back together, unheralded.